Departures between 10:00 and 17:00, after 20:00 on Mon to Sat and full day on PH terminates at Kailey Industrial Centre, Fung Yip St.
and full day on PH. * Departures between 10:00 and 17:00, after 20:00 on Mon to Sat and full day on PH will be diverted to operate as below. 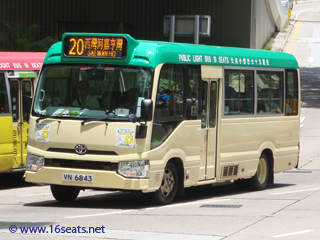 Passenger may enjoy a complimentary ride on the second leg when interchange from this trip (Chai Wan bound) to HKI GMB route 20M (Chai Wan Industrial City bound) by using the same Octopus within 60 min. Services between 10:00 and 17:00, after 20:00 on Mon to Sat and full day on PH depart from Kailey Industrial Centre, Fung Yip St.
Chai Wan Fire Station PH. Passenger may enjoy $3.9 fare discount on this trip (Grand Promenade bound) when interchange from HKI GMB route 20M (Hing Man Est bound) by using the same Octopus within 60 min.